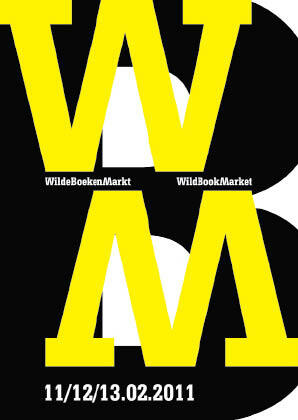 ARTISTS, PUBLISHERS, MAGAZINES AND CULTURAL INSTITUTIONS are invited to participate in the 2013 edition of the WildBookMarket at the Re: Rotterdam Art Fair from 6-10 February 2013! This 4th edition of the WBM during Art Rotterdam will take place at a new and exciting location, the Re: Rotterdam Art Fair at Blaak 16-18, Rotterdam (next to Willem de Kooning Academy, close to station Blaak). Last year, the Re: Rotterdam Art Fair had its successful premiere as a side programme of Art Rotterdam. It focused on solo presentations of more than 175 individual artists, and managed to draw more than 9000 visitors. 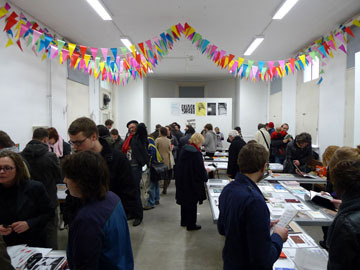 By relocating the WBM to the centrally located venue of the Re: Rotterdam Art Fair , WBM and you as a bookseller will be able to profit greatly from the visibility and popularity of the Re: Rotterdam Art Fair during those busy days. This year more than ever, the WBM will be the perfect opportunity to browse through, buy or exchange rare art books. The WBM 2013 will have space for about 30 stand holders (publishers and magazines) with individual tables and for about 150 individual international entries by artists on collective tables. Publishers can hire a bookstand, (table), individual artists can submit their artist books which will be sold by the WBM team for you. The WBM will provide you the tables and chairs. Due to the allocation of places it is required to register. To guarantee your participation, please use the online form as soon as possible. Registration deadline: 25 january! There is an online registration form for ARTISTS and for PUBLISHERS . Your details will be immediately uploaded into our database. The sooner you register, the better! A guaranteed large audience. You will be mentioned on the WBM and HWW websites, press releases, printed flyers, advertisements on Trendbeheer and will be included in the catalogue. The catalogue will be published on the website and will also be available in print during the WBM. WBM will be mentioned in the press releases from Re: Rotterdam. – Books can be either delivered at HWW in person, or sent by regular mail or courier. The Netherlands. Ensure that shipments are received at HWW before 1 February 2013. – Packages with insufficient postage will not be accepted by HWW. – Sent by courier: Please note! Do make sure you send packages to HWW (same address above) and that we do not need to be retrieved in a wear house elsewhere (like eg GLS FedEx)! Check with the mail service. – Please send us an email when you have sent the books so we know they are on their way. When applicable: send us the track and trace number. We will confirm by email upon delivery. – WBM is not responsible if books are being delivered wrongly or too late to us. – Upon delivery, added to your books should be a filled in delivery form on which your name and address, contactinfo, the titles, the number of copies per title and prices are stated. Also please indicate whether you are want to donate a copy to the HWW library. – Each book needs to be priced inside in the front with a paper or written with pencil. – For publications in editions: provide at least 3 copies but no more than 10 copies. – The administration of sales for artists selling their books will be managed via a central cash register. – Presence of the artist during the art fair. You are not expected to be present as a seller of your own books during the fair (but welcome as a guest). You could also act like a publisher by means of sharing a table with other artists an run your own administration. – 25% commission is charged on the sale of all books sold. This will be deducted from the total revenue at the end of the WBM. The revenue from books sold can be collected from HWW in cash, when you collect your unsold copies. We will NOT transfer it onto bank accounts. 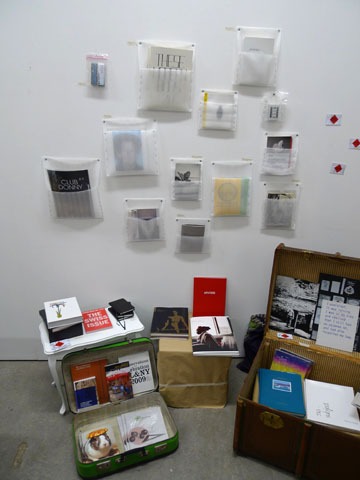 – Books not collected before March 15 2013 will automatically become part of the artist book library from Het Wilde Weten. – Publishers and institutions will manage their own sales and administration and are expected to run their own stand during opening times. – The available space for each individual standholder is on table. If you would like to share a table, that is possible, but need to be notified before registration. No more than 2 organisations can share one table. – Upon your registration by filling in the online form, you will receive an invoice by email. The € 150,-(no VAT applicable) fee needs to be paid no later than February 1, 2013. If the money is not received on our bank account by that date, we cannot guarantee a place at WBM. – Het Wilde Weten reserves the right to refuse participants due to the character of the proposed titles that we find not suitable enough for this context. We expect to see mostly recent titles, books older than years can be refused. – The swapping of books is the responsibility of the parties involved: HWW will not interfere. – Het Wilde Weten is not responsible for theft, damage or disappearance of books. – Het Wilde Weten is a non profit organization. The WBM is a huge project run by many volunteers. The applied fees are covering the actual costs only. HWW would be very pleased to receive your book as a donation for its library! ← 13.01.2013 A Toast to the New Year!